Who said testing ETOPS had to be boring? At 13:33 PST on the 9th Feb, 2012, Boeing Commercial Airplane Flight 236, painted in Air India livery, departed Boeing Field Intl (KBFI) for an 18 hour maximum ETOPS (Extended Operations) flight test as part of the 787-8 GE engine certification. Rather than engage in just another certification flight (and, perhaps, in an attempt to generate a little more media attention), the team from Boeing’s Boeing Test and Evaluation division came up with the idea of turning the aircraft into a 200 million dollar “etch a sketch”. The aircraft cruised at Flight Level 350 at a speed of .85M to successfully paint both the Boeing logo and “787” over northern US airspace. 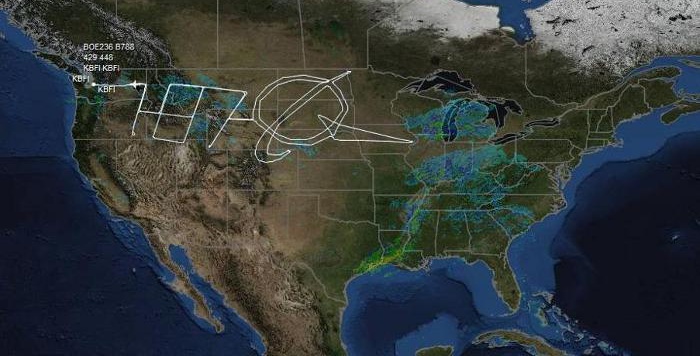 The skywriting exercise was captured by Flight Aware and other tracking services. Total flight time was 19 hours and 12 minutes with a total distance covered of 16,751 km. Following is the flight plan that was filed with ATC. The following profile was rendered by Flight Aware.